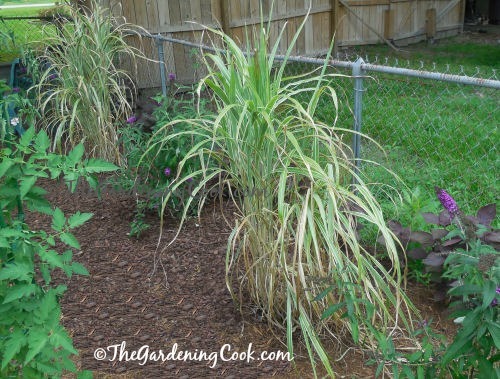 Japanese Silver Grass – Miscanthus sinensis – is a perennial plant that has variegated green and white striped leaves and huge plumes in the fall that stall well above the top of the plant. 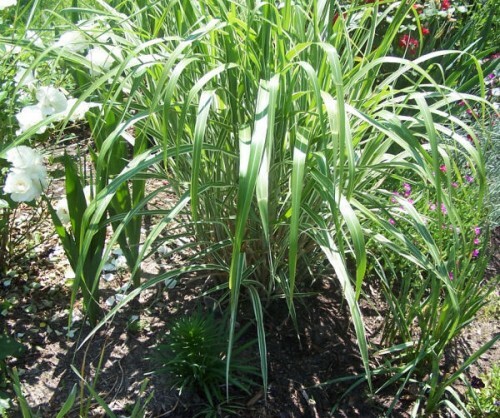 I planted a small Japanese Silver Grass plant in my front bed last spring. I knew it would get fairly large so I wanted it to be a focal point at one end of the bed. The plant did well last year, but this year it is just fabulous. It is an easy care plant and all I have really had to do it make sure to cut it back in the fall so that I could keep it somewhat contained. 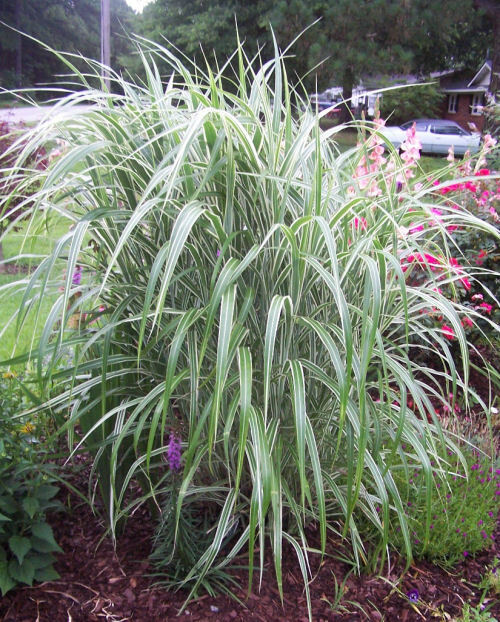 If you are looking for a large plant that is easy to grow and yet very striking, Japanese silver grass is the plant for you. Likes full sun and well drained soil. Can be used as a hedge if planted about 4 feet apart and does a great job of hiding fences. 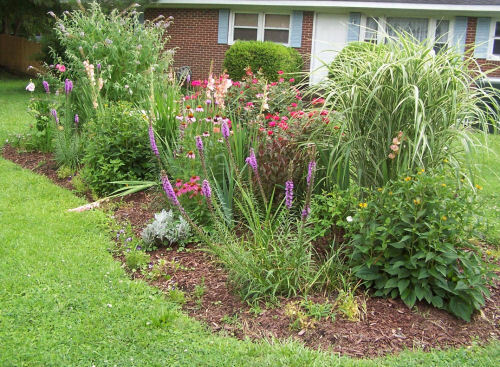 This is my front bed showing a large butterfly bush on one end and the Japanese Silver Grass on the other. I will add another picture later in the summer when it flowers! Update: September 13, 2013. 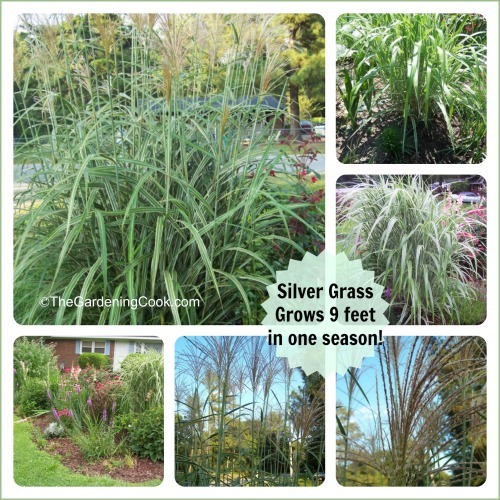 The silver grass has outdone itself this year! It is about 9 feet tall and just covered in flurry grass like tufts. The plant is about 5 feet wide now. Make a lovely focus on one side of the garden bed. It was so easy care. Got very little water other than natural rain and has been beautiful all summer. There are dozens of these wheat like sprigs at the top now. Here is a close up of the blossom. It is hard to believe that I cut this to the ground last fall and it has managed to reach this size again in one season. I will be doing the same thing this fall. 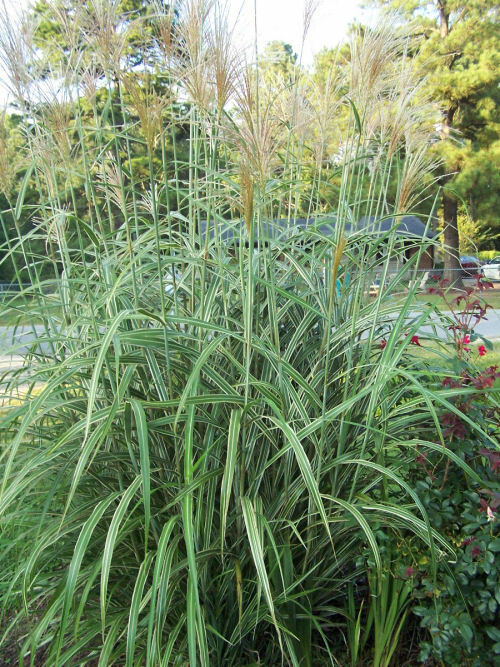 If you are looking for a large focal plant, silver grass can’t be beat. Update: my Japanese silver grass got so large this year, it overgrew the space I had for it in my front garden bed. My husband and I dug it up and made 6 divisions of it. After a month of rooting in pots, I planted it along the fence line in my back garden to hide my neighbor’s yard, which can be unsightly at times. It took well and is quite large now. Next year, the neighbor’s yard won’t be visible at all! This looks perfect for opposite a side window where I need something to lessen the visual impact of the neighbour’s house. I am in New Zealand so it may not be marketed under that name here. Do you happen to know the latin name at all please? Hi Lynne. 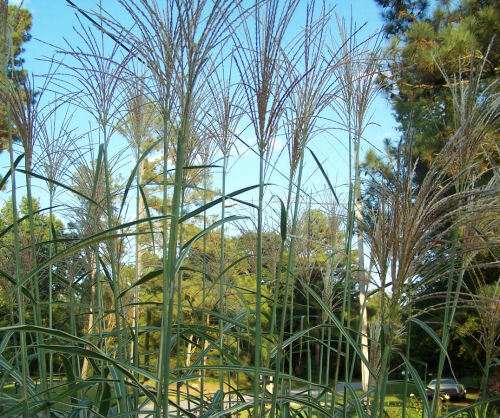 The plant is called Miscanthus sinensis. I’ve added this to the article. 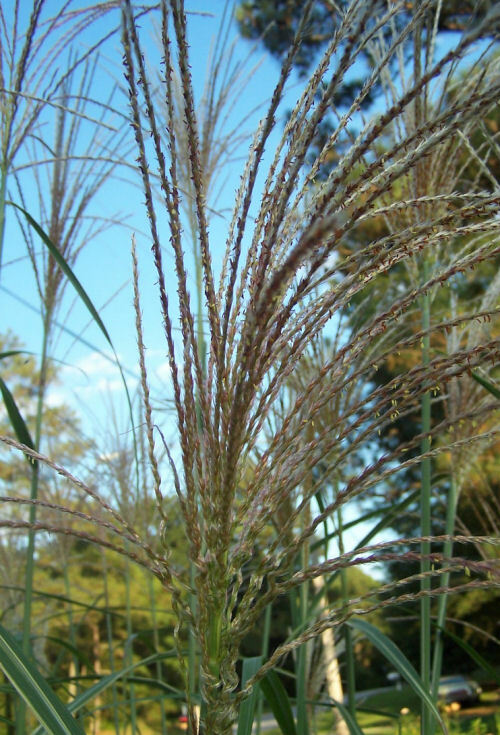 Can you tell me when is the best time of year to plant Japanese silver grass? Im in central Indiana.